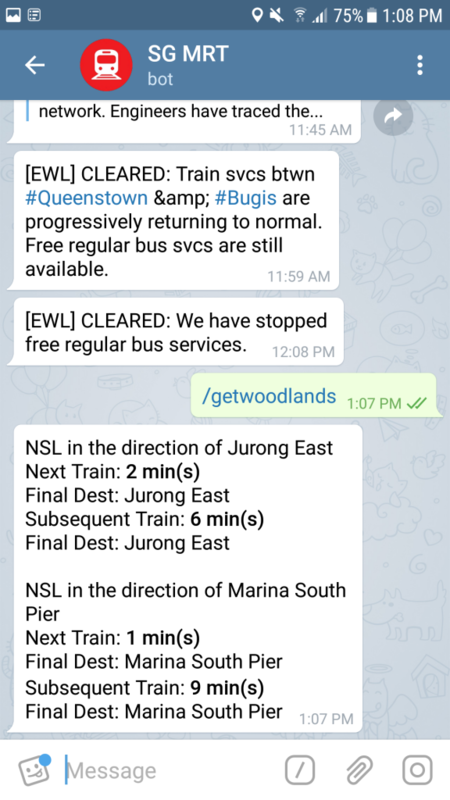 This NSF Built A Telegram Bot To Let Us Know When SMRT Fails Because "Where Got Time?" This morning, MRT-taking Singaporeans were once again greeted with the news that 2 lines – North-South and East-West – were hit with power and track circuit faults. First reported at 7.26am, SMRT announced 4 hours later that it had to shut services between Queenstown and Bugis stations to “remove the loose panel causing power trips on the network”. A few hours ago, Queenstown station was also seen to be packed with commuters. Of course, track and power circuit faults are something out of our control, but what if there was a way that we could avoid about them even before official reports? 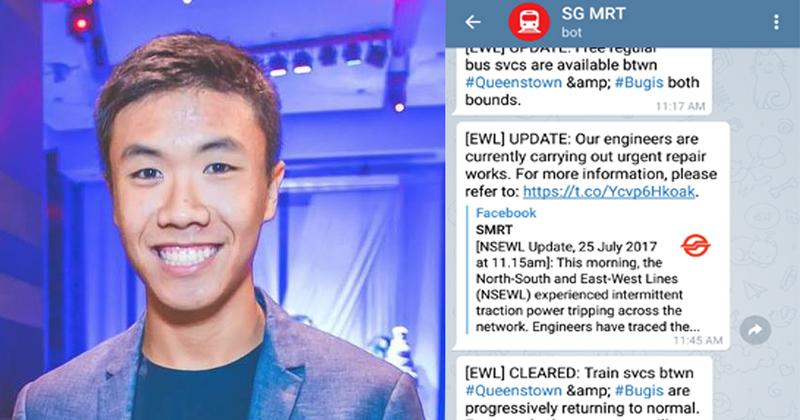 22-year-old Marcus Koh, known as chihao711 on Reddit decided that it was time to use his bot-building skills for the greater good, and has created a Telegram bot so that commuters can know, first-hand, whenever an MRT breakdown happens. 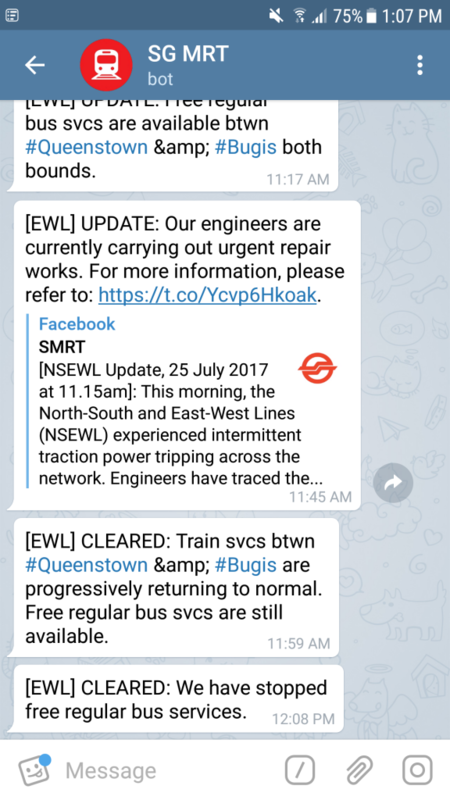 3 days ago, Marcus took to Reddit to publicise his Telegram bot, the very functionally-named SG MRT, which would inform users whenever there was a breakdown/disruption, and also the arrival timing of trains at various stations. Holding a Computer Engineering diploma and set to go to NUS to study Computer Science soon, Marcus created the bot a few months ago, initially just for personal use “because [he] wasn’t sure that the general public wanted it”. Then, it was also only built to tell when the next train was arriving. However, it was after he realised the increasing frequency of train disruptions that he decided to bring his little project even further – by having it notify him whenever there was a disruption. Currently an NSF, Marcus knows very well the importance of time, and this further spurred him on to create a solution for those like himself. With his weekdays burnt with his NSF-ly duties, Marcus only had the weekends to embark on his side project – eventually emerging with the bot after a few weeks. SG MRT isn’t his first rodeo with bots, however – he has built one to detect the location of users and give them a list of nearby bus stops (SingaporeBus_Bot) and also others like Push2Me. Pretty impressive for someone who learnt how to build a bot by watching video tutorials. For now, the bot is only able to pull information for SMRT lines (North-South, East-West, Circle Line), but Marcus is hoping that he can eventually include the Downtown Line and North-East Line to the bot if he manages to get his hands on the data. When I asked if there were any other that bots that we could look forward to, Marcus reveals that for now, he wants to focus on his MRT bot “so that it becomes great and easy to use”. Check out the SG MRT bot here!